According to Advertising Super-Giant J. Walter Thompson, 2008 may officially mark the end of the ability to segment, categorize, or otherwise label customers on a broad scale. This is really not a huge surprise, especially for those of us who for many years have been skeptical of the kind of “pigeonholing” advocated by such instruments as the VALS II. This great nation of ours was built on rugged individualism! American consumers have always used their purchasing ability as an empowerment tool, and as the number of consumer choices grows, so do the number of possible combinations of items a consumer can buy, and how they can buy. I think Harry Beckwith said it best in Selling the Invisible, when he discussed how even two best friends, who are best friends because they have so much in common, won’t have exactly the same posessions, or even the same attitudes & ideals about their posessions. Labeling and categorizing consumers has been problematic from day one, but has become increasingly so due to the changes in consumer lifestyle afforded us by the amazing number of choices American consumers have. That’s not to say that customer profiling isn’t useful. What we have to do is learn as much as possible about our own customers, and, if possible, each individual customer and then customize our offerings accordingly. Once you delve into your customer information, you may even see some similarities that lead you to some logical groupings, leading you to develop your own customer categorizations. That is altogether different from trying to take someone else’s template and overlay it with your customer information, and far more useful. In other words, your customer database is now more valuable than ever if you use it to its potential! Comments Off on The Death of Segmentation? Remember that eery scene from the first Jaws movie where the woman is swimming at night in the ocean? She first feels something bump into her, then something tugs her down a couple of times, then she’s seen being dragged violently through the water, then she’s seen no more! And the scary Jaws da-dum, da-dum, da-dum da-dum da-dum theme is accompanying this terrifying depiction! It’s a brilliant piece of suspense filmaking, but it happened that way by accident! Now don’t get me wrong, Steven Spielberg is a brilliant and highly accomplished director who had impressive credits before Jaws and has since earned himself icon status many times over in motion picture history. 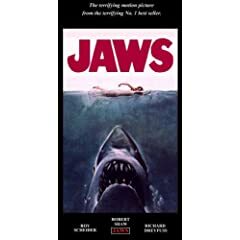 And it was indeed his idea to write the scenes for the opening of Jaws as is now historically known, but that opening wasn’t his first choice. As business professionals, we need to remember that every opportunity may first come to us disguised as a threat! If we’ll take command of the situation and see what possibilities exist, we may create for ourselves a set of successful circumstances that exceed anything we originally imagined. So the next time you face a challenge or threat, get excited and then go about working to turn it into an opportunity!